Avoid overflying of built-up area of the city and surrounding villages during take-off and landing. CTR Ruzyně is located 2 km south of AD Slaný. AD circuits shall be carried out to the south only, to avoid CTR Ruzyně. AD Slaný is located under TMA I Praha. MAX height above AD is 1000 ft/300 m AAL. Before landing on RWY 25L/R the minimum height above road must be 20 m (60 ft). THR of RWY 25L/R is permanently shifted by 100 m for this reason. 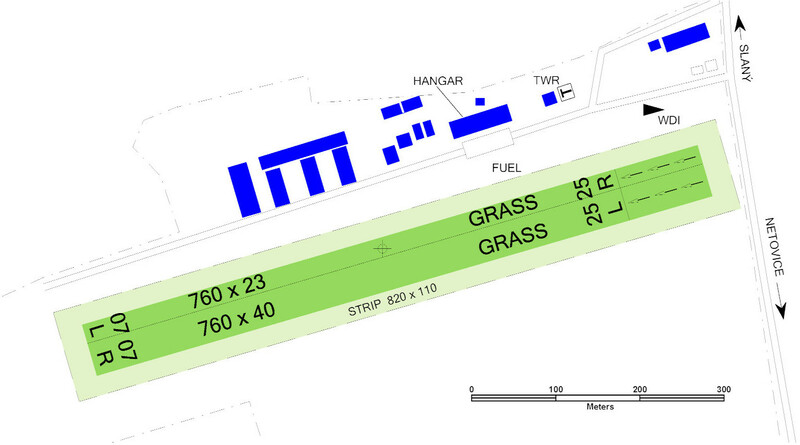 Permanently shifted threshold of RWY 25L/R is designated by threshold marks and flags. Landing distance available (LDA) is 660 m. RWY 25L/R is without restrictions for take-offs and that is in original take off distance available (TODA) 790 m. During the operational hours the landing T sign is marked out on the left of the RWY in use. The traffic circuit altitude is 1920 ft / 580 m AMSL. 1.3.1Avoid overflying of built-up area of the city and surrounding villages during take-off and landing. 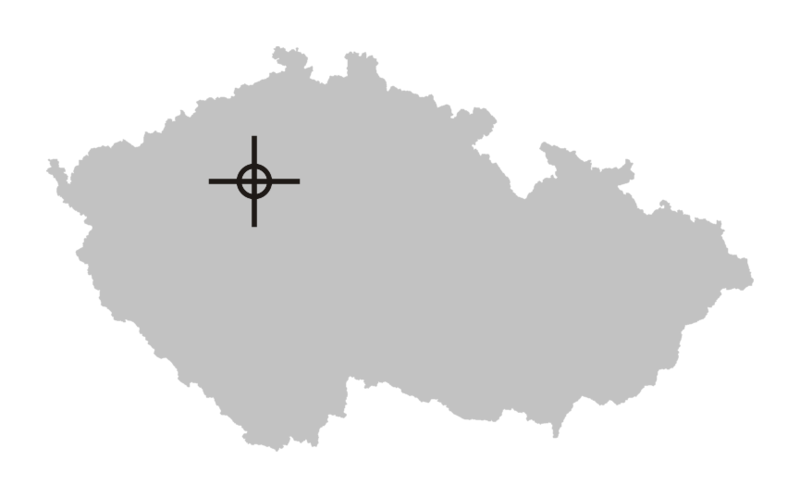 1.4CTR Ruzyně is located 2 km south of AD Slaný. 1.5AD circuits shall be carried out to the south only, to avoid CTR Ruzyně. 1.6AD Slaný is located under TMA I Praha. MAX height above AD is 1000 ft/300 m AAL. 1.7Arrival of aircraft without two-way radio communication is possible only after previous agreement with the aerodrome operator. 1.8Before landing on RWY 25L/R the minimum height above road must be 20 m (60 ft). THR of RWY 25L/R is permanently shifted by 100 m for this reason. Permanently shifted threshold of RWY 25L/R is designated by threshold marks and flags. Landing distance available (LDA) is 660 m. RWY 25L/R is without restrictions for take-offs and that is in original take off distance available (TODA) 790 m. During the operational hours the landing T sign is marked out on the left of the RWY in use. 1.9Disability of manoeuvring area is likely to be expected after snow melting or after prolonged rains. 2.2Outside operational hours arrivals to LKSN are allowed only by prior arrangement with the aerodrome operator (check of movement area serviceability). 2.3Arrival/departure of an aircraft with total length of fuselage greater than or equal to 9 m or with maximum fuselage width greater than 2 m is permitted only by prior agreement with the aerodrome operator (to arrange rescue and firefighting services).